Today Nissan has unveiled its brand new Navara EnGuard Concept, an all-terrain rescue pick-up with portable EV battery power. 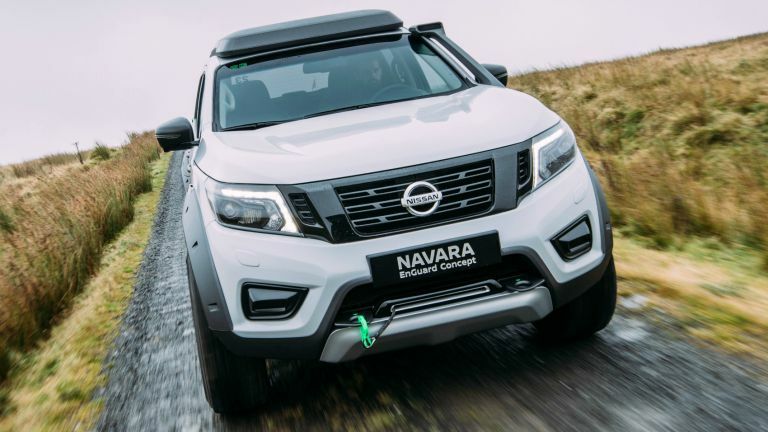 The EnGuard Concept has been designed to showcase the Navara's ability to operate in the most challenging conditions, as well as show off Nissan's brand new portable battery pack. The battery pack, which is in a prototype stage right now, utilises the same technology as seen in the Nissan Leaf and e-NV200 electric vehicles, and allows for a variety of specialist cutting or heavy-lifting rescue equipment to be powered without the need for a petrol generator. The EnGuard Concept features two of these battery packs, which when docked in the vehicle, are charged automatically by the power generated by the vehicle's 2.3-litre 190PS twin-turbo diesel engine. Crucially, the battery packs also generate zero emissions when in use and, with no flammable fuel, they can be used in enclosed spaces such as a building or a cave - factors that are incredibly important when attempting rescues in disaster zones. Each battery is a 2kW unit composed of seven Nissan EV battery modules encased inside a weather-proof, machined aluminium housing. Of course, being a rescue vehicle, the EnGuard Concept also features a comprehensive suite of safety and rescue equipment, including two-way radios, ropes, oxygen tanks, resuscitation kits, life jackets, buoyancy aids and an axe. Key to the car's rescue role is its included DJI Phantom 4 drone, which comes stowed in its large load bed. The drone is one of the most advanced on the market right now and boasts an operating ceiling of 6,000 metres and a top speed of 20 metres per second. Further, it has an impressive non-stop operation time of almost 30 minutes and can relay images back to the NavaraEnGuard Concept at high speed. The images can then be viewed on the car's in-built pop-up HD screen, which is hidden in the load bed wall.